This is a simple and nutritious dish, easily prepared. It is best accompanied by slices of fried haloumi cheese (see photo), which is from Cyprus but is available worldwide. It can, however, also be accompanied by any other semi-hard, salty cheese fried. As I said - simple and nutritious! Wash the spinach and cut up roughly. Wash and finely chop the spring onions and dill. Put the spinach, onions and dill in a pan and boil for 5 minutes. In a separate pan simmer the rice until it is half boiled, with enough water left to just cover it. Add the spinach, onion and dill mixture to the rice, stir well and continue to simmer until the rice is boiled. 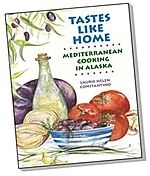 Mix the juice from 1 lemon with the olive oil, beat well and pour on top of the food. Turn off the heat without removing the pan. Slice the cheese and fry in a non-stick pan, turning it over so that it is done on both sides, until it has softened and acquired a light golden brown colour. Spread the juice from the remaining ½ lemon on top of the cheese. Serve the spinach rice with the slices of cheese on top. 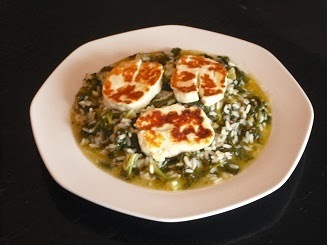 Great idea to serve halloumi with spanikorizo - one of my favorite dishes. This recipe sounds delicious. And easy is always a bonus.